Are you a new paint contractor in the market? If so, one of the hardest decisions you’ll be faced with is which paint sprayer to buy. This is because there are dozens out there in the market which possess fancy features along with unique specifications. 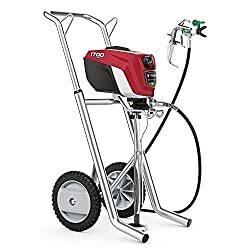 Seeing so many different commercial paint sprayers and having all of them look almost the same makes it difficult to differentiate one’s specifications from the other. Being a paint contractor means it is your responsibility to be aware of all the latest models and know which one will suit each customers’ needs. While all of these are difficult tasks, you don’t need to worry any further because we’ve made things a lot easier for you! After some comprehensive research, we’ve listed our top five tried, painted and tested favorite models of paint sprayers. Not only this, but we’ve also created a general buyer’s guide which highlights all the important features you should be looking for in the device. Read on for detailed reviews and descriptions of the top five paint sprayers that will help you select the right commercial paint sprayer. For commercial use, you need long-lasting, sturdy, and effective paint sprayers that can offer impressive results. After all, a poor paint job can have a negative effect on your business. This is why we have listed only the best options in our detailed review, with all the features and reasons, why these five options made it to our list. Our top pick would have to be the Graco Magnum Airless Commercial Paint Sprayer. It’s super convenient and practical to use all thanks to its endless features. This latest addition in the Magnum x series makes a controlled paint flow possible. The air pressure of paint flow is completely adjustable to give you the ultimate experience without having to get professionals to come to paint your home. The 100 feet long rubber hose is sturdy and long-lasting which is not at all vulnerable to breaks. You’ll also have the advantage of not having to drag the machine with you in the entire house thanks to the long length of the hose. The Magnum x7 works well for professionals and allows you an annual use of around 120 to 130 gallons of paint. A very reliable suction tube allows you to paint the walls straight from the bucket which has a capacity of one to five gallons alone. You won’t have to deal with heavy equipment as this lightweight paint sprayer is portable and easy to move. Users have been in agreement about the convenience and practicality that comes with using the Magnum x7 Commercial paint sprayer. Apart from being easy to use, users have maintained that it’s also easy to maintain and clean. However, some complained that the machine may be capable of overspraying at times. With endless features being offered at such a reasonable price, there’s really not much to think about! The Graco Magnum x7 Commercial Paint sprayer definitely won’t disappoint. If you’re a new paint contractor and want to leave an impression on your customers, the Wagner Airless Twin Paint Sprayer is definitely the product for you. It’ll give you that perfect refined finish with a complete professional touch. The high quality 50 feet long hose that comes with the Wagner airless paint sprayer is durable, reliable and not at all subject to breaks. Overspraying is not a problem with this product due to its controlled pressure feature. The device is also very easy to use thanks to its lightweight equipment which can be effortlessly moved around. The paint bucket has an impressive capacity of five gallons alone. The Wagner paint sprayer doesn’t disappoint when it comes to practical usage and professional results. Some users, however, have complained of it being a bit difficult to clean. Some customers also said that the solutions on the manual weren’t as effective as the ones on the Magnum x7 manual. You may have to spend a few extra minutes cleaning the device, but with those professional results and such a fine finish, it’s a fair compromise if you ask us! The Wagner commercial paint sprayer remains in the top 5 due to its remarkable outcome. Next on our list of top 5 picks is the Titan ControlMAX 1700 PRO Paint Gun. The Titan Paint Gun is powered with High-Efficiency Airless technology (HEA). This means that the device has a 0.6 horse-powered motor which is designed especially for spraying with pressure suitable for all surfaces. The paint gun’s capacity is 300 gallons per year and 0.33 gallons per minute. Its interior and exterior are both designed in a way which prevents you from making a mess. The product includes a protector which stops materials from spilling or overflowing. Overspraying is 50% less compared to other paint guns due to the precise tip size. It is highly mobile, making it very easy to move around adding to the convenience. Users have been impressed regarding their experience with the Titan Paint Gun since its an affordable and practical option. However, many customers have expressed the concern that it lacks many of the features offered by other paint sprayers. The hose is comparatively smaller in size and the main issue with the device is that it can be very difficult to clean. 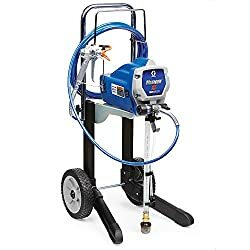 If you’re looking for a budget-friendly option with some high-quality features and results, then the Titan PRO paint gun is a good option. However, forgoing some features and putting in some effort to clean the machine are a part of the package. The Graco Magnum X5 Commercial Paint Gun is the best option to go for if you’re on a budget. Not only is it super easy on your pocket, but the features offered are of the best quality! The results the device gives are no less than professional and perfect for commercial usage. The device is equipped in such a way to prevent overspraying and give full and precise coverage. One of the key features that the Magnum X5 paint gun offers is its ability to provide high-quality priming making the machine very easy to use. Its capacity is 125 gallons per year. The controllable pressure of the pump allows you to avoid overspraying. The hose is up to 75 feet long making the machine easy to move around. Customers have been all praise of the Graco Magnum x5s ability to provide all types of coating. However, some customer reviews have highlighted some flaws in the device such as not being very efficient in handling thinner liquid paint. 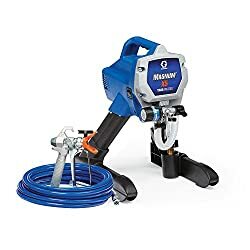 The Graco Magnum X5 Commercial Paint gun is the best option if you’re on a budget and can’t afford the first two products on the list! The results are professional, and the device is simple and practical to use. 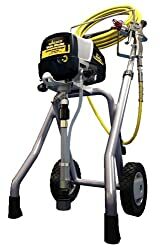 Last on the list of top 5 commercial paint sprayers is the 580005 ControlMax Spray-Gun by Titan. This product is suitable for both beginners as well as professional painters. The model includes a 25 feet long hose. Its high-efficiency airless technology allows a 0.55 HP which prevents the possibility of overspraying. Despite these unique features, the Titan Professional Paint Spray-Gun has many cons. One of these is the 25 feet long hose. This is the shortest hose length compared to all the other options listed above. Apart from this, the device is pretty expensive considering other paint sprayers are available at a better price and with more features. Customer reviews indicated that users were happy with the results the Titan Paint sprayer gave and the high-efficiency airless technology helped to control overspraying. However, customers maintained that it was very difficult to clean the device. Some claimed that it is not suitable for commercial use. Some also complain about the high price, considering it has lesser features. The Titan 580005 ControlMax Professional Paint Spray-Gun is a fair option and gives good results. However, the price is high and the features are lesser. So only go with this option if the other four aren’t available to you. Here are the 10 main factors you should consider when selecting a paint sprayer machine. An important point to look at, the size is where you start when buying a paint sprayer. Considering your project size helps you decide an appropriate size for the sprayer tip along with power required for your task. This, of course, may vary from small to large. This again helps you decide an appropriate size for the sprayer tip. Consider the location of your project and how large-scale or small-scale it is. From this, you’ll know the kind of paint you need. For example, outdoor tasks require thicker paint. Then decide the size of the tip of the sprayer according to the kind of paint you’ll use. Considering this factor will help you to a large extent in choosing the correct paint sprayer machine. The paint storage capacity decides how much paint you can carry at once. If you’re carrying out a small-scale task, then a smaller capacity for storage will be fine as you would be done in a lesser amount of paint. However, if it’s a large-scale project, then its practical to select a paint sprayer with higher capacity. Otherwise, you’ll constantly need refills which will be a nuisance. The paint coverage refers to the total volume of paint that is transmitted from the bucket which contains the paint, to the area you’re covering. Higher coverage would be very suitable and practical if you’re covering a larger area as opposed to a smaller one. Your job will be made easier and quicker through greater coverage. You need to make sure that you know how much noise the device makes prior to buying it. Each model has a different makeup and interior, and so creates different levels of noise. Considering your project is in a quiet neighborhood as opposed to an industrial area, too much noise will cause a lot of disturbance for the people nearby. Thus, make sure to be well informed about the device before you buy it. If you want to successfully select the correct paint sprayer machine then knowing the exact size of your task is super important. For larger tasks, having a longer hose and power cord will be beneficial because then it’ll be easier to move around. If the cord and hose are of small size and you have a large area to cover, this won’t be an ideal situation since you’ll end up dragging the entire machine everywhere you go. Hence, this factor should be kept in mind to save time. If certain accessories are included with your paint sprayer machine, they can make your experience a lot easier and practical. These may include conditioners and protectants, extensions, filters, hoses, protective gear, and tips. Conditioners act as protectants for your paint sprayer machine and make it more durable and long lasting. Conditioners such as liquid formulas which prevent your machine from freezing, rusting and corroding. Filters will give your results more life, and help you achieve more professional results. The prevent the scattering of paint and making a mess, they remove waste and residue from paint, and give a much finer finish. There are three types of paint sprayers available in the market. These three types include Compressed, High Volume Low Pressure (HVLP) and airless sprayers. Compressed air sprayers are best for furniture, HVLPs are suitable for the interior of the house such as walls, doors, and cabinets. Airless sprayers are most suitable for outdoor tasks such as fences, decks, and garages. It is important to make sure you know which type of paint sprayer machine you are buying, and you need to do your research and know which type will be best suited for your task. Before you finalize which model to go with, consider whether its manufacturers offer a warranty or not. Products that are backed up with a warranty offer more security for your money and are more reliable than others. This way, if your machine unexpectedly breaks down earlier than expected, you can expect a quick reimbursement without spending more money. If this isn’t the case then you’ll be in a loss! Also, consider devices that have good reviews. Reading customer reviews and feedback and help you make the correct decision. All products come with some kind of additional features which you can consider when choosing what to buy. Same is the case with paint sprayer machines. Features such as adjustable spray direction, the size of the spray fan, ability to switch the spray nozzles and attaching the paint filter directly to the spray gun are some features that can be kept in mind when selecting which model of paint sprayer machines to buy. Feeling a tad bit better? We certainly hope so! Being a competitor in the market requires high professionalism and the best work. 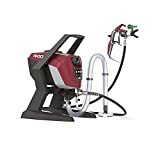 That’s the sole reason why we did our research and created this detailed list of top 5 best commercial paint sprayers of 2019 for you. The comparison table should also help you get a step closer to your decision by comparing the five best sprayers with each other. If you ask us, the Graco Magnum X7 Airless Commercial Paint Sprayer remains number one in terms of best features, quality, professionalism, and price. The Graco Magnum X5 is a great option too considering your options are limited due to your budget. It’ll give professional results as well at a lesser price. We really hope that our hard work was of use to you and helped you in selecting the right paint sprayer machine for your project. You can also check out this video for guidance on how to use your paint sprayer machine.